Construction sites have many hazards that workers, vendors, and visitors will encounter. Fires and explosions however, are the most tragic accidents that can occur on construction sites. These types of accidents can cause serious injuries and extensive damage. Since fire and explosion accidents are not localized, they can potentially injure or kill anyone who is in the vicinity of the fire or explosion. There are 4,800 construction fires annually which result in $35 million in property damage. According to the National Fire Safety Council, approximately 11 fires are reported every day. These fires account for 3% of deaths that result from work related accidents. Buildings under construction have been reported to be more prone to fires. However, the majority of construction fires and explosions are the result of open flame or arson. There are other factors though that could lead to a fire or explosion. Following proper safety codes and procedures can help to prevent construction site fires and explosions. Every construction site in the United States utilizes fire codes and procedures from the Occupational Safety and Health Administration (“OSHA”), and make an effort to protect their workers, vendors, and visitors. However, there are times when codes and regulations are set but they are not implemented on the construction site, usually due to carelessness or a disregard for the rules. When the codes and regulations are not followed, the safety of the construction site is compromised and accidents will occur. 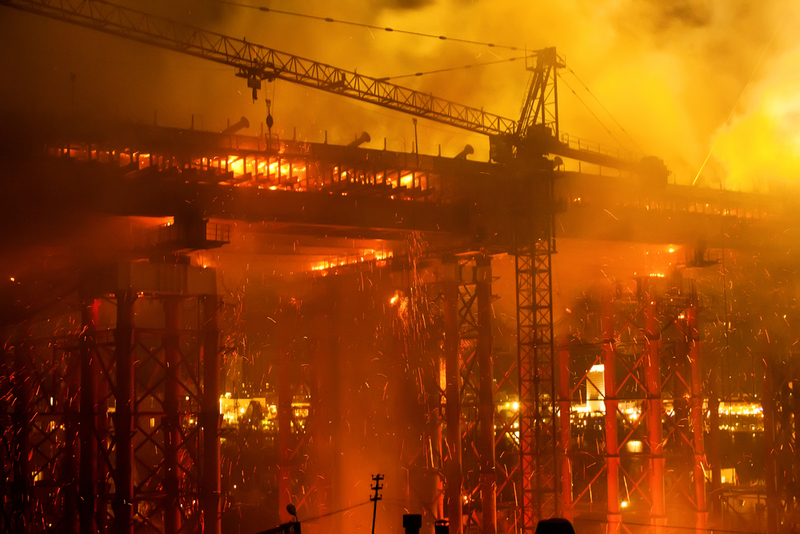 Devastating injures can result from fires and explosions on construction sites. These injuries can leave the victim with pain and suffering for the rest of their lives. Extensive medical treatments, multiple surgeries, and rehabilitation can also be required because of injuries that result from fire or explosions. It is important to contact a lawyer immediately if you or a loved one has been injured due to a fire or explosion. Claims for injuries that result from fires and explosions can be very complicated, so it is extremely important that you find a lawyer that knows the law and will fight diligently for your rights. Our experienced fire and explosion accident lawyers know that injuries and death sustained from the fires and explosions con the construction site can be avoided. We know how serious injuries from fires and explosions can be, how those injuries can lead to deteriorating health issues, and how these health issues can have a lifetime effect on you and your loved ones. Should a third party be involved and is also responsible for the injuries you sustained in the fire and explosion, you may also be entitled to punitive damages. If you or a loved one has been in a fire and explosion accident and has suffered injuries, you may be entitled to a cash settlement. The fire and explosion accident lawyers in our firm have over 70 years of combined experience in these matters. The Hudson fire and explosion accident attorneys at Greenberg and Greenberg handle cases throughout New York State, including Columbia, Greene, Rensselaer, and Albany County. Our legal team has earned a reputation for dedicated service to our clients injured in New York personal injury accidents. Please contact us today to receive a FREE case evaluation by dialing locally to 518-828-3336 or call toll free at 877-469-9300.